THE Islamic Movement of Nigeria (IMN), otherwise called Shiites have declared that President Muhammadu Buhari would not win in Sokoto, Kano, Kaduna and the Federal Capital Territory. The Movement said that President Buhari would lose in those states following the continued killings of people in those states and the continued detention of Sheikh Ibraheem El Zakzaky and the killing of their members, according to a report in 247ureports..
Daily Post also reports on the same subject matter. According to the online newspaper, the Shiites declared on Monday that Buhari was on his way out of office. “Buhari can feel the inevitable defeat coming his way, so the desperate attempt by the administration to cause chaos so that the elections will not hold, at the same time becloud its brutal and inhuman Saudi-sponsored Zaria genocide that resulted in the brutal death of 1000+ innocent children, women and men in Zaria in December 2015”, IMN spokesman, Ibrahim Musa, said in a statement sent to DAILY POST on Monday. IMN also alerted that it had obtained a secret circular written by the Department of State Service (DSS) which was dispatched to all Service Chiefs, Inspector General of Police and heads of other security agencies. It said the DSS, in the memo, urged them to take aggressive stance against the Islamic sect. The letter reads in part: “Intelligence availed to this service revealed plans by the leadership of IMN to mobilise its membership in large numbers for a massive protest and other hostile activities, including the use of explosives and firearms in the days ahead. 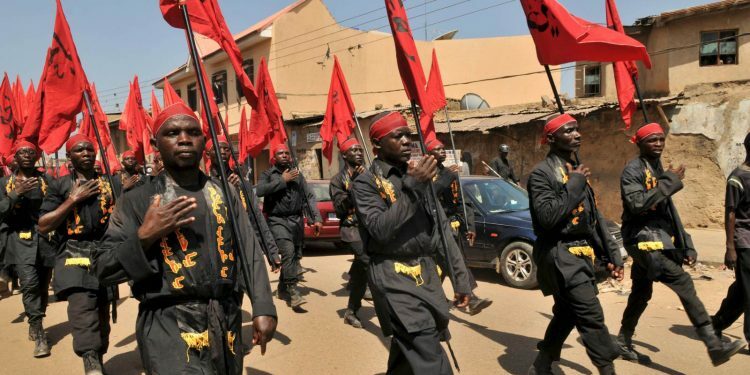 It was gathered that the group intends to besiege some major Northern cities and towns in Kano, Kaduna, Sokoto and the Federal Capital Territory (FCT) for the planned attack. Reacting, IMN, assured Nigerians and the international community that the allegation was malicious and unfounded, aimed at maligning the Movement with a view to painting it in bad light. “There is no iota of truth in their claim, and it is just mere fabrication to justify the killing of members of the Movement ahead of February 16, Presidential election. “We have said it several times that our protests are peaceful and have demonstrated that on the streets. All protest staged by the Islamic Movement in Nigeria are peaceful including the Free Zakzaky protest in Kaduna, Kano and the Federal capital city, Abuja. “It is the Nigerian Army and Police that turn some of these peaceful protests violent by their attacks with live ammunition and in some cases battlefield weapons on peaceful protesters. The comprehensive revelation by the New York Times video on the Abuja Shia Massacre by the Elite presidential guard is a pointer to this fact. “Not only that, it is on record that during the 2011 election violence, Sheikh Zakzaky and other members of the Islamic Movement did all they could to stop the violence and even gave refuge to victims of the senseless killings, as a demonstration of its peaceful nature and its belief in mutual understanding between people of different tribes, regions and religions. “For a secret security service to now accuse us of planning violence is the height of the rot in its intelligence gathering and manufacturing systems. “In view of the foregoing, we categorically reject the unprofessional, unintelligent and baseless allegations made by the DSS and confirm that we do not know the existence of or have any link what so ever with any group called Islamic State West Africa Province (ISWAP) and we have no plan to besiege or attack any town, place or person.